Picnic at Hanging Rock was written by Joan Lindsay in 1967 and made into a very moody and memorable movie by director Peter Weir in 1975. Now, a new TV miniseries picks up the story of an ill-fated picnic in rural, turn-of-the-century Australia. The legend goes like this: On Valentine's Day 1900, at a remote prep school for young women outside Melbourne, Australia, several students and their teacher slipped away from a holiday picnic, ventured to a steep and storied landmark named Hanging Rock — and vanished. When director Peter Weir's movie Picnic at Hanging Rock was released in the 1970s (it was an adaptation of Joan Lindsay's 1967 novel) the story was widely presumed to be — and even was publicized as — true. Though that theory is less accepted these days, the legend (and its unresolved ending) still require that the story itself be approached and told somewhat ambiguously. That's the challenge of a new, six-part TV miniseries premiering on the Amazon Prime streaming service on Friday. But because the miniseries length allows for an expanded narrative, this new version ends up being stronger and significantly more powerful than the original. The new Picnic at Hanging Rock is adapted by Beatrix Christian and Alice Addison, with a trio of directors framing the story visually. And the visuals are both important and arresting. The girls in this Australian finishing school wear bright, free-flowing white cotton dresses, while the woman running the school — the formidable Mrs. Appleyard — wears a series of brightly colored, tightly constricting outfits. The students stand out as starkly as the oppressed women of The Handmaid's Tale, only their uniforms are lily white, not blood red. And Mrs. Appleyard, played by Natalie Dormer from HBO's Game of Thrones, wears her clothing as both a shield and a disguise. When Mrs. Appleyard talks to her students before releasing them to mingle at a local garden party, she's like a military officer inspecting her troops. She explains that her girls are to pay particular attention to the brave young men who will be attending the party, because they're soldiers about to head off to war. Then she assigns the girls a research paper on the Boer War — and when a student named Marion impolitely asks who will read and grade the papers, Mrs. Appleyard gives the task to Marion herself, as a punishment. Mrs. Appleyard is a fascinating figure, and this new Picnic at Hanging Rock fleshes her out substantially by showing her in extended flashbacks. Her past, it turns out, is much less civilized and savory than her present status, which explains why she fled to the Australian outback in the first place. And it also explains why when she has to drop her civilized veneer, she can do so chillingly. In one scene, Mrs. Appleyard enters the stables as a young soldier attempts to molest one of her students. The girl responds by stabbing the boy's boot with a pitchfork. The school headmistress yanks the pitchfork from his foot, instructs the girl to wash the blood off her dress, and tells the boy she'll get him morphine for the pain only if he agrees to say that his injured foot was trampled by a horse. He meekly goes along. Dormer, as Mrs. Appleyard, is even more menacing and captivating here than she was as Margaery Tyrell on Game of Thrones. She's a big part of why this new Picnic works so well — and Samara Weaving, playing a rebellious student named Irma, is another. 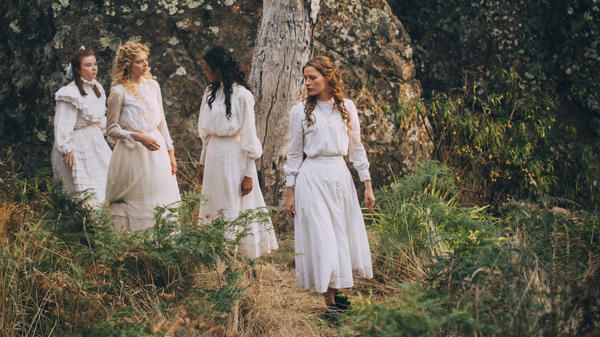 But there's also the depiction of the world that both the students and the teacher, as women, must endure that makes this TV version of Picnic at Hanging Rock so compelling. The near future of The Handmaid's Tale is a chilling place to visit — but so is the distant past of Picnic at Hanging Rock. This is FRESH AIR. I'm TV critic David Bianculli. Today on the Amazon Prime streaming service, a new six-part TV miniseries premieres that expands on an earlier movie and novel and, like its predecessors, comes from and takes place in Australia. "Picnic At Hanging Rock" was written by Joan Lindsay in 1967 and made by director Peter Weir into a very moody and memorable movie in 1975. Those accounts, like this new one, tell of an ill-fated picnic in rural, turn-of-the-century Australia. On Valentine's Day, 1900, at a remote prep school for young women outside Melbourne, several students and their teacher slipped away from a holiday picnic, ventured to a steep and storied landmark named Hanging Rock, and vanished. When the movie was released in the '70s, "Picnic At Hanging Rock" was widely presumed to be - and even was publicized as - a true story, part period folk tale, part supernatural mystery. That's less accepted these days, but the legend and its unresolved ending still requires that the story itself be approached and told somewhat ambiguously. That's the challenge of this new TV adaptation. But because the mini-series' length allows Amazon's "Picnic At Hanging Rock" to expand on the narrative, this new version ends up being stronger and significantly more powerful. The new "Picnic At Hanging Rock" is adapted by Beatrix Christian and Alice Addison, with a trio of directors framing the story visually. And the visuals are both important and arresting the. The girls in this Australian finishing school wear bright free-flowing white cotton dresses, while the woman running the school, the formidable Mrs. Appleyard, wears a series of brightly-colored, tightly-constricting outfits. The students stand out as starkly as the oppressed women of "The Handmaid's Tale," only their uniforms are lily white, not blood red. And Mrs. Appleyard, played by Natalie Dormer from HBO's "Game Of Thrones," wears her clothing as both a shield and a disguise. When she talks to her students before releasing them to mingle at a local garden party, she's like a military officer inspecting her troops and just as imposing, especially to one girl, Marion, who dares to speak up while in the inspection line. NATALIE DORMER: (As Mrs. Appleyard) Some of our brave boys have joined the mounted rifle brigades to fight in Africa for queen and country. Today's fate is to fare them well. You will maintain a serious demeanor at all times. On Monday, you will write a composition about the Boer War. MADELEINE MADDEN: (As Marion Quade) And who will read those? DORMER: (As Mrs. Appleyard) As our new history teacher has yet to materialize, Marion will mark your compositions out of 10. MADDEN: (As Marion Quade) Yes, Mrs. Appleyard. DORMER: (As Mrs. Appleyard) Ladies, hats on. In pairs, please. BIANCULLI: Mrs. Appleyard is a fascinating figure, and this new "Picnic At Hanging Rock" fleshes her out substantially by showing her in extended flashbacks. Her past, it turns out, is much less civilized and savory than her present status, which explains why she fled to the Australian outback in the first place. And it also explains why, when she has to drop her civilized veneer, she can and does chillingly. In this scene, Mrs. Appleyard enters the stables when one of those young soldier boys has just begun to sexually attack one of her students. The girl responds by stabbing through the boy's boot with a pitchfork, at which point Mrs. Appleyard arrives, yanks the pitchfork from his foot, gives the girl some orders and gives the boy a whiskey flask and a warning. UNIDENTIFIED ACTOR: (As character, screaming). DORMER: (As Mrs. Appleyard) Find the water. Clean your dress. Behind the house, there will be a pump. Clean your dress. Say nothing to anyone. Go. UNIDENTIFIED ACTOR: (As character, panting). DORMER: (As Mrs. Appleyard) Hurts like the devil to be trot on by a horse. I suppose you're drunk. Dr. Mackenzie will get you something for the pain. You'd like that, wouldn't you? Then button up your trousers. BIANCULLI: Natalie Dormer, as Mrs. Appleyard, is even more menacing and captivating here than she was as Margaery Tyrell on "Game Of Thrones." She's a big part of why this new "Picnic" works so well. And Samara Weaving, playing Irma, one of the rebellious students, is another. But there's also the depiction of the world that both the students and the teacher as women must endure that makes this TV version of "Picnic At Hanging Rock" so compelling. The near-future of "The Handmaid's Tale" is a chilling place to visit, but so is the distant past of "Picnic At Hanging Rock." BIANCULLI: On Monday's show, we'll talk about Rodgers and Hammerstein with Todd Purdum. His new book explores the creative partnership that transformed musical theater. He'll talk about shows that didn't work and the stories behind their great successes. Join us. FRESH AIR's executive producer is Danny Miller. Our technical director and engineer is Audrey Bentham with additional engineering support from Joyce Lieberman and Julian Herzfeld. Our associate producer for digital media is Molly Seavy-Nesper. Thea Chaloner directed today's show. For Terry Gross, I'm David Bianculli. Transcript provided by NPR, Copyright NPR.